First, my thanks to God the Most High, who has protected us, supported us and granted us victory, pouring on us His Benefits that are impossible to count. And I thank and salute all those who have shaped this victory and took part (in one way or another) in shaping and achieving it, be they men of the Resistance, of the army and security forces, of the various factions of the Resistance, martyrs, wounded, prisoners and their families, refugees, steadfast and patient people and all those who made sacrifices, current and past Presidents, religious, political, military and security leaders, parties, forces, movements, committees, organizations, media, all the brave people of Lebanon and of the entire Arab and Islamic world, and all around the world. And special thanks are due to those who firmly stood by our side during this war, namely the Islamic Republic of Iran and the Syrian Arab Republic for their historical position alongside us. O my brothers and sisters... I read the thanks quickly, and by the grace of God, the titles will be inclusive [of all those who contributed to the victory] so I'm not forced to mention (them one by one) in detail. We celebrate this anniversary today (the victory of 2006), which is dear to us. It's been twelve years since we won this victory, and we emphasize the importance of the celebration of this occasion. Similarly, God willing, we will celebrate in a few days in the city of Hermel the first anniversary of the Second Liberation (of Lebanon) –we must also hold the celebration of this date dear– against terrorism and takfiri groups. And just as we were victorious during the July (2006) War, I wish to state that what happened for seven years and until now is a Great July (2006) War on the entire region, aiming to achieve the same objectives, the same project and the same hopes that the July 2006 War endeavoured to achieve. And as we came out of the July 2006 war victorious, we will come out soon, with God's grace, victorious in this Great (World) War against our region and against the Resistance Axis in our region, to celebrate this divine, historical and major victory, which is close, very close, and will happen very soon. We stress the importance of this celebration in order to emphasize the importance of the feat accomplished, to honor those who shaped this feat –the fighters, the martyrs, those who have made sacrifices and their leaders, the honorable, loyal and sincere people–, to root this victory in the feelings, culture and (collective) consciousness, to open the horizon and give new hopes against the waves of despair and humiliation, in the face of the inhibition of wills and appeals to surrender, to draw lessons and to consolidate our points of strength. Today... As I speak today and I am going to make another speech in a few days (dedicated to the August 2017 Liberation from ISIS), I will discuss the 2006 war and the regional situation together as a single point, with a part I will complete in my next speech in Hermel, and I will say a few words about the internal situation (in Lebanon), and I also will complete them in my speech in Hermel. If we go back to 2006, everyone remembers that the objectives of the war were to achieve the American project at the time, which was led by George Bush and his administration, after they occupied Afghanistan and Iraq and arrived at the borders of Syria and the Islamic Republic (of Iran). There was a major project in the region, for which targets were set. The 2006 war was fundamental in this project, and when it failed, the project collapsed with it. Of course, afterwards, they made new studies and new careful calculations, and have engaged in a new plan. So there was a plan for the US hegemony project aiming to crown Israel as a fundamental, leading and axial element in the (project of a) New Middle East. The plan fell apart when we came out victorious in the 2006 war, when the Resistance in Gaza came out victorious, when Syria and Iran stood steadfast, and they then developed a new plan, the one against which we have fought in recent years and to this day. If Lebanon had fallen, it was planned to continue the project in the same year in Syria in 2006, and against the Palestinian Resistance in Gaza. But the (victorious) Resistance of Lebanon postponed the war against Gaza by two years. And it was planned to besiege Iran to isolate it and then strike it and put an end to this (Resistance) Axis, and forever. Such was (the plan) in 2006. The (victorious) Resistance of Lebanon made these objectives and plan collapse, and pushed back the aspirations of the United States and Israel in our region for several years, taking us into a new battle, and caused very significant developments: it not only foiled the objectives (of the enemy), but it caused very important developments. It increased the power of the Resistance in Lebanon, Gaza, Palestine, Syria, Iran, Iraq, and (all) the region. This victory took place, and no one (kindly) granted it to us: it is neither the Security Council, nor the UN, nor the Organization of Islamic Cooperation, nor the Arab League nor the Arab regimes that shaped this victory, but it was a blessing of God Almighty and Exalted and of the sacrifices of our people, of his patience and of his (victorious) Resistance, and thanks to the fact that he stayed on his land and came back to it (very promptly, as soon as the cease-fire was declared), thanks to the blood of its martyrs, the courage of its Mujahideen and fighters, and the steadfastness of the political position. We arrived at a new stage. I will not talk (any longer) about 2006, and I now turn to the current situation. Well, today, during these “seven terrible years” (cf. Qur'an 12, 48), they brought the region into war, and even into several wars, all aimed at achieving the same previously stated objectives. And their axis is Israel, their goal is Israel and the strengthening and rooting of Israel (in the region) and his consecration as the (undisputed) master of this region. Therefore I will allow myself to speak (at length) about the situation in the region in relation to Israel. That is to say, where are they today, and where do we stand, even if it takes a bit of time, because we lead a battle for awareness, for will, for hope: today, these are the real titles of the battle waged in recent years, during those years and in the coming years. So we will consider Lebanon in terms of the fight against Israel, as well as Syria, Palestine, Gaza and (all) the region. For all that happened aimed to serve Israel and its interests. I will not talk about the situation seven years ago (beginning of the war in Syria), but from where we are after those seven years, that also are seven years of steadfastness, strength, endurance, sacrifice and bloodshed (for our cause). Where is their project, where are they, and where are we, what are the position and situation of the Resistance Axis? Let's start with Israel and Lebanon. How are things between Israel and Lebanon since 2006 to date, in 2018? It is clear that Israel is deterred (from any aggression against Lebanon). This Israel who, all his life, was attacking Lebanon for the most trivial reasons –its planes were bombing the south, the Bekaa, the North, Mount Lebanon, even the heart of the capital. You all remember the situation before 1982 and after 1982. But things have changed, and Israel does no such thing today. And it's not because of good manners (allegedly acquired by) Israel, but thanks to the (deterrent) equation imposed by the Resistance. Today, Israel, since 2007 to date, continually rebuilds and refounds itself in the light of its (2006) defeat and of the consequences of this defeat. They reviewed their combat doctrine, their military strategies and tactics –each time a new Chief of staff takes office, he writes a new strategy for the Israeli army–, their structure, the training of their forces, they have reconsidered their facilities and equipment and weapons, they continually hold maneuvers since 2006 and until yesterday, yesterday, there were maneuvers in the north. Why? Why all these maneuvers, these reconsiderations, etc.? Because they consider that in Lebanon, there is a force that worries them (greatly), and that is to them, in their words, a “great threat” the “main threat”, and they are preparing to face it (at their best). (Throughout its history), when did we find Israel behaving this way towards Lebanon? (Never before 2006). Israel hides itself behind the walls (it erected at the border) with Lebanon. They work constantly on their home front, and set out their fears at this level. Today, in every action –and I am not revealing secrets, even their media speak of it–, Israel considers (the risks of strikes against) the electricity, gas, oil, its gas facilities, the colonies, the depth, etc., because they know that in front of them, there is a serious, powerful and capable enemy. And I will conclude on this in a decisive sentence. Israel carries out a (diligent) monitoring of the forces of the Resistance. Since 2006, they gather information about us, our weapons, the number of our fighters, our actions, our expertise. And when we went to Syria, they watched us (constantly), (worried) about our new acquisitions in experience and expertise in Syria. And as regards Lebanon (Hezbollah), it takes a very serious and very important place in their calculations. Until we come to... Throughout its existence, Israel had never erected defenses in northern (occupied) Palestine. If defensive measures were required, it was in southern Lebanon (because Israel was always on the offensive). For the first time in the history of the Zionist entity, defensive lines are built in the north of Palestine to face the project of Liberation of Galilee (announced by Hezbollah). And Israel holds annual military exercises to prepare for that prospect. And field measures are taken and constantly reviewed and improved. Until a few days ago, as part of the (recent) maneuvers in the north (of occupied Palestine), a senior officer in the Israeli army –this is reported by Israeli newspapers, not myself– said: “Hezbollah is the most powerful army in the Middle East after the Israeli army, because it has this, this, this and that.” Of course, I do not agree with him on this estimate. We do not consider that Hezbollah is the most powerful army in the Middle East after the Israeli army, but this statement expresses how the Israeli enemy sees this Resistance he wanted to eradicate during the July 2006 war. Today, in 2018, this Resistance is, as I have always said and repeated every year, and allow me to repeat it again today, and the important thing is that the Israeli enemy knows very well that it is the strict, the undeniable truth: yes, the Resistance in Lebanon today, in its arms, its equipment, its capabilities, the number of its fighters, its cadres, its power, its expertise, its experiences, its faith, its determination, its courage and its will is stronger than ever since its launch in this region (in 1982)! Certainly, Israel can threaten (us with war) every day. Remember, just weeks after the end of the July (2006) war, Israel threatened Lebanon with a vengeful war that was (supposedly) approaching fast. But you can count (the years of peace) with me: where is this war that Israel (continually) threatened us with and for which it asserted itself ready, having supposedly fixed all its shortcomings and faults, promising that it would shortly launch a new war against Lebanon? They threatened us (with war) in 2007, and 2007 has passed (peacefully). (Same thing in) 2008, 2009, 2010, 2011, 2012, etc., until 2018. For 12 years, Israel has threatened us (permanently) to launch a war (imminently). 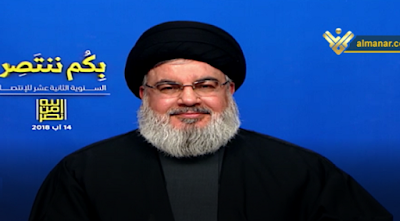 But while they threaten to launch a war (against us), at the same time, they continue to evoke the fact that the Resistance becomes stronger (by the day) and that its (fire)power is increasing, until one of their officers said that Hezbollah is the most powerful army in the region after the Israeli military. I want to tell him that we are not the most powerful army in the region after the Israeli military, leave this subject aside, because it is not precise, and we do not want to create problems (by competing) with the armies of the region. But let me say to that senior Israeli officer, on (the date of the commemoration of) the July (2006) War, that Hezbollah is stronger than the Israeli army! The Resistance in Lebanon is stronger than the Israeli army! For either in 2000 or in 2006, it was never a question of manpower, equipment, quantity, capabilities, weapons or rockets / missiles. Today we have more faith in the righteousness of our cause than you have in your false, usurping cause. Today we are more willing to sacrifice than your miserable army and society, living in worry with many problems and in many files. Today we have more faith and confidence than ever in our God, our Creator and He who granted us victory, ever since God the Almighty and Majestic created us. Today we have more faith, trust and confidence in His Promise of victory addressed to the patients and sincere fighters. This sincerity, this faith and patience, we have them more than ever because of the accumulation of experiences. When the Commander of the Faithful, Imam Ali –peace be upon him–, said in one of his maxims: “War is (like) a debate, sometimes we have the advantage, and sometimes the enemy has the advantage, until God sees our sincerity, then He gives us victory and defeats our enemy.” He did not say “until God sees our weapons, our missiles / rockets, our equipment and our fighters”, but “until God sees our sincerity”. This sincerity, this authenticity and this faith, with which the people of the Resistance, the men of the Resistance and the families of the Resistance fought in 2006, today are bigger, stronger and more rooted (than ever). And so your calculations are wrong (O Israel): we are not (necessarily) stronger than the other armies (of the region), but we are stronger than you. That's all regarding Israel (and Lebanon). Secondly, Israel and Syria. (The United States and Israel) had planned to topple Syria in 2006 if the Resistance in Lebanon had fallen (in the July war). For if the Resistance had been defeated in 2006, they planned to bring multinational forces in Lebanon –because the Israeli army could not have stayed after the war–, US, French, English, Italian forces, etc. These forces were supposed to settle in Lebanon, close the border between Lebanon and Syria and besiege Syria to make it fall. This did not happen. The past seven years (of war) have therefore befallen in order to topple Syria in another way, namely the global war that was launched against Syria. I will mention only Syria from Israel's point of view. Israel is a full partner of the project of war against Syria since 2011, and fully participates in decision-making and in the US-Saudi-Western plan. On the ground, Israel has provided all the necessary support to the armed groups in southern Syria, all the logistical & medical support, weapons, food and information, up to occasional military interventions to help these groups. And we all remember, during the last seven years, the statements by Israeli officials who said that President Assad would fall within 3 or 5 months and that the interest of Israel was the fall of the regime. Today, there are people (analysts, journalists, officials) in the Gulf or elsewhere who philosophize about the fact that Israel would never have said anything like that, but anyone can refer to the archives of the past seven years, during which all the leaders of the usurper entity, without exception, expressed hopes that President Assad and the Syrian regime would fall, and that they'd see these (terrorist) groups replace them. The Syrian opposition, who visited the Zionist entity, brought pledges (of friendship), and regarded Israel as a friend, and Israel hoped to see Damascus become an allied or friendly capital instead of being an enemy capital. All this is common knowledge. Such were their hopes, and they worked (relentlessly) to achieve them for seven years, but today, those hopes have been scattered to the four winds. The world is not prepared to give them the Golan –maybe Trump would be willing to recognize (the Golan as Israel's) but the international community and the world today are (humbly) standing in line to restore relations with Syria and the Syrian State. And for your information, in this line, security services worldwide outnumber diplomats, because today, the world is afraid of the return to their country of tens of thousands (of terrorists) that they have brought to Iraq and Syria from all the over world. What will they do there (attacks, etc.)? That's why they need Syria and security cooperation with Syria. The world will not give the Golan to Israel nor recognize it as Israel's, neither in a unilateral gesture, nor under pressure from Trump. For example, to return to Lebanon, behind the scenes, you know that there is a lot of US pressure on the Lebanese State to settle the issue of the land and maritime boundary with Israel. But in whose interest? In the interest of Lebanon? No way. They want to settle the issue of the (Lebanese-Israeli) land and maritime boundary in the (exclusive) interest of Israel. And when we speak of the maritime boundary, it also means (the resources in) oil and gas. But that time is over. The time when Israel was imposing its conditions on Syria, the time when Israel was imposing its conditions in Lebanon (is over), even if Israel is (fully) supported by the United States and one hundred United States. This is not an impulsive or emotional statement. This is confirmed by the facts during decades of confrontation, of victorious Resistance, of sacrifice and blood spilled. Now let us consider (the situation) in Gaza, in Palestine and primarily in Gaza. Despite the destructive war, despite the severe blockade... The United States, Israel and their allies expected Gaza to surrender, and that in exchange for food, medicine, electricity and (drinkable) water, Gaza gives them absolutely everything and accepts the “Deal of the century” and anything else required from them, and accepts any resolution (of the conflict), even at the expense of Palestinian rights. But Gaza has not submitted, has not surrendered and has not signed (the Deal), despite the fact that the whole world has forsook them. The whole world has abandoned them. And more, Gaza reinstated and upheld the equation of the Resistance, responding to (missile) strikes with strikes, to blood with blood, to fire with fire This is why today, this Israel that strives to convince us that he is the strongest and is about to attack us so that we accept all that he wants to impose, is in a major deadlock even against Gaza. During the debates within the enemy government (in restricted committee), the Ministers are killing and insulting each other because they are lost in their choices against Gaza. Against Gaza the besieged, Gaza the starved, Gaza the abandoned by the whole world, Israel that you claim to be the most powerful army in the Middle East is completely disoriented. One of them said it is best to uphold a truce, even at the cost of concessions (easing of the blockade) to Gaza because we can not move towards war. Another retorted that if one moves towards a truce and grants concessions (to Gaza), maybe the same thing as with the Lebanon will happen, and Gaza will become stronger year after year. Yet another –of course they are all Ministers– exclaims that they must launch a destructive war against Gaza, but someone asks if he considered the retaliation (of the Resistance in Gaza) and recalled that wars were conducted without achieving any results. Yet another promotes the invasion of Gaza and a new occupation, and someone reminds him that they have left Gaza recently. Israel is completely lost, confused and deadlocked. And this is against Gaza. Why? Because Gaza resists, as one man, despite the existing disputes (between Palestinian factions). Gaza makes sacrifices every day, especially every Friday. All this is happening against Gaza. And it confirms the limits of the power of Israel. Even if they have an (over-armed) military and the most powerful Air force in the region, it does not mean that Israel is almighty. It does not mean that he can do whatever he wants. It does not mean that we are nothing, that we are zero, that they can erase us, that we are out of the equation. Never. Things are not so. As for Israel, and the Deal of the century, with the arrival in power of Trump, –in this topic, allow me to express myself with even more frankness than I usually do–, with the arrival of Trump in power in the United States, and of Mohammad Bin Salman in power in Saudi Arabia, and with the assumption that the region was heading towards collapse and that the Resistance Axis was going to be eradicated, they concocted the odious Deal of the century, that we all know today, and the best that Israel could ever dream of is that this agreement is realized. For it gives them Al-Quds (Jerusalem) in a final and everlasting way, irrespective of what is located above or below ground, what is east or what is west, they take all Al-Quds, the refugee issue is erased, the existence of Israel in the region is normalized (by relations with all Arab countries) and the Palestinians get a State which is not a State within a small and narrow extent of territory. For two years, some have been trying to impose on the peoples and governments of our region the idea that the Deal of the century is a Decree impossible to escape, and that we cannot but accept it. But who says that? Every time they were making agreements and were developing catastrophic solutions (for Palestine), they came to the peoples of the region, to the Resistance movements and governments in the region, stating that this was an inevitable Decree that nobody could prevent. But the truth is quite different. Today, in light of the developments that have occurred so far... Some believe –and this is an opinion that matters, issued by leading experts and political and strategic thinkers– that the deal of the century is over, that it failed, and that we are just waiting for this to be announced. For my part, I will not say that, because the issue needs further reflection, study and time, but I can tell you that this Deal of the century that Trump wants to impose with all his arrogant strength, and in which he wants to swing a big country in the region that is the Kingdom of Saudi Arabia, along with other countries, this agreement faces real problems. And there's a very good chance, if we insist on the equations (of Resistance) which we always talk about, that this agreement will collapse, now more than ever. What are the proofs of this? Why (is it that I can say that)? First, the unanimous rejection of the Palestinian people towards the Deal of the century. Throughout Palestine, there is no faction, authority, power or popular Resistance, no Palestinian or Palestinian side that supports this agreement. That's the first point. There is no Palestinian leader, man or representative of the Palestinian people that would agree to sign an agreement giving Al-Quds (Jerusalem) to Israel and making it the eternal capital of Israel. No way. And they (all) announced that. An agreement without Palestinian signature (has no value). Even if they were to impose it by force. If Palestine does not sign, the agreement can not function. And it (really) surprised them. They may have counted on the fact that by putting pressure on the Palestinians, terrorizing them and starving them, or by promising them money or some projects (port, airport...), some Palestinian would come sign such a Deal. (But they were bitterly disappointed). Second, the fact that the Resistance Axis stood steadfast, that Iran resisted, the victory of Iraq against ISIS crazies & Wahhabi movements funded by the United States and Saudi Arabia, the victory of Syria, the fact that Yemen stood firm, all this extended Axis (from Palestine to Iran), not to mention the developments in Lebanon (victory of the Hezbollah alliance in the elections). All this has its influence. You were getting ready to impose an agreement on the assumption that there would be no more Resistance, Resistance Axis or countries of the Resistance. This is what you imagined a few years ago. But now, the facts are very different from your expectations. And third, the crisis in the United States themselves, who figure they can come and impose the Deal of the century on the peoples and governments of the region, while they have (serious) problems even with their allies and friends, whether Europe or Turkey –you follow the evolution of this crisis every day–, not to mention Russia and China. Also, among the most important things that push the Deal of the century to fail, and here I ask you to be pay attention, (I have to mention) the decline of the regional Axis led by Saudi Arabia in the region. This Axis is pushed back and it weakens. What is the proof of that? I speak only of (undeniable) facts, they are accessible, and field data reported by the media. Why? First, this regional Axis failed completely in Syria, it's over. It's (game) over for them. Yes, there is still Idlib, and if it is not over by then, I will speak about it on Sunday (August 26) in Hermel. This Axis has failed in Iraq. This Axis has failed to push the world to besiege Iran and to impose (international) sanctions on Iran with Trump. And this Axis has failed in its war in Yemen. Today, let me tell you, from my Dahiyeh (southern suburb of Beirut) in Lebanon, to the innocent victims (Dahyan) of Sa'dah, Yemen. O dear, noble and worthy people, especially the families of children who were martyred, know with certainty that those who killed you are the same as those who killed our children in Dahiyeh and in Qana. Those who have shed the blood of your wives and children are the same as those who have shed our blood in Lebanon. The same weapons, the same Axis, the same countries, the same determination, the same decision, and the same behavior. And just as the blood of our children and women triumphed in Lebanon, the blood of your children and wives will triumph in Yemen. Because behind this blood stand truth and justice, as well as (real) men and (authentic) leaders who will not forgive these criminals and bloodthirsty murderers, those who behead all feelings, all morality and all honor. When this Axis arrives at this level of atrocious massacres in Yemen, this is a clear message that militarily, it has failed, that the military option is over. They lost the war, but they want to avenge themselves on the people who inflicted this defeat on them. And internal crises in Saudi Arabia, the crisis in the Gulf and within the Organization of Islamic Cooperation (OIC)... The open crisis is with Qatar, but there are also hidden crises within the OIC. (And see the situation) with Canada, because of a minor problem. Now, whether it is because of this problem or in order to please Trump (who is in conflict with Canada), this question should be studied more closely (to respond). Canada has merely raised the issue of human rights and political prisoners with Saudi Arabia, and it caused (an indignant reaction like) Judgment Day in Saudi Arabia, which has denounced interference in its internal affairs, recalled its ambassador and expelled Canada's, ended the scholarships... They geared up for confrontation and turned everything upside down because of this (alleged) Canada interference in Saudi internal affairs. And this while Saudi Arabia intervenes, fights and supports fighters in Syria and Iraq, is interfering in Iranian affairs, openly announces a war without mercy against Yemen and interferes in all the details of Lebanese affairs –and we all remember the day they arrested the constitutional Prime Minister of Lebanon, just like that. They allow themselves to interfere (wherever they want), but if anyone in the world dares to say: “Respect human rights and release those political prisoners”, they dump on him all the thunders of heaven. What is this mentality? Where are they going? Anyway, they are experiencing (major) crises. Even with Turkey, they have a serious problem. Because Turkey is convinced that Saudi Arabia and the UAE were involved in the recent coup. Even with the Muslim world, they are in crisis. I give you an example, so that you understand what will happen to the Deal of the century. In Malaysia, there was a head of government who was with the Saudi dynasty, an instrument of Saud, to whom they gave huge sums of money, and who worked for them for many years, but he was defeated in the elections, and is now behind bars, accused of corruption. And a new government is now in place, with a position (very) different vis-à-vis Saudi Arabia, the war against Yemen, sanctions against Iran, relations with Iran, the US administration, the Palestinian cause, the issue of Al-Quds (Jerusalem). Members of the Malaysian government have a (very) different position (towards all these issues). And it is the same situation in Pakistan, the country where Saudi Arabia has also spent billions of dollars: the leader of the previous government, who was an instrument of Saudi Arabia, is behind bars, charged with corruption. And provided they do not foment a coup against them, a government will be formed and it will have a very different position (from that of Saudi Arabia) on the issue of Al-Quds, Palestine, Gaza, Yemen, Iran and the United States. This is the situation. This (Saudi-Israeli-American) Axis is (clearly) in decline. Let no one give us headaches with the daily lies of TV satellite channels from the Gulf. Lies, lies, lies, lies, lies, lies, until eventually people believe them. Such is the real regional situation. This Axis is declining. The image of Saudi Arabia today in the Arab-Muslim world and elsewhere, for which it has spent billions of dollars, so that it is presented as the Kingdom of Good, today, in the consciousness of the world, what is it the Kingdom of? The Kingdom of those who sent these ISIS-crazies and takfiris movements who destroyed the Arab and Muslim world, who perpetrated the most heinous crimes in the Arab and Muslim world and threaten the safety worldwide. What is their image with the war in Yemen? The siege, cholera, famine... And then they dare to say they provide (Yemen) with support on the issue of cholera, opening a corridor so that (the sick) can be treated. And up to their support for the Deal of the century, about which it is said that they would have backed off. Very good. Why are they backing off? Because they understood that (signing) this agreement would be a suicidal action. Two more words about the regional situation. Israel and its internal crises: the corruption of the Prime Minister (Netanyahu), the disappearance of the historical leaders, persistent conflicts between parties, generalized anxiety, lack of confidence in the future. The atmosphere created by the media is only intended to reassure them and to keep them in the land they usurped. And also their Nation-State Law (institutionalizing the superiority of Jews). I do not have time to comment it in detail, but it will have a major impact on this entity. In the light of all these facts, we develop our position today. What happened in 2006 and what happened for 7 years aimed to allow the United States to seize this region, to root Israel permanently (as a dominant client state) and to impose a resolution (of the Palestinian issue). Today, in 2018, I claim that this project has failed, or is about to fail definitively, with the Grace of God. What is the lesson to draw from all that (I have just described)? Now I come to the conclusion. (The United States) have now only one way (to attack us). They know that wars lead to no result. Yesterday, His Eminence Imam (Khamenei), the Leader, may God preserve him, as he was speaking about the United States, said there would be no war. The US, Israel and this (Saudi) Axis know well that wars lead to no result, and they know that they will be defeated in any war they'd launch (against us), because they were defeated in the current wars and continue to be defeated. The US-Saudi alliance, assisted by (Gulf and West) States, failed (miserably) in Yemen against the Yemeni people, who has modest resources, but great men and women. This alliance, which also failed in Iraq, Syria and Lebanon, and has succeeded nowhere, knows that (any war will be disastrous). One of the benefits of the current situation is that wars are (now) left aside. Let no one threatens us with war, or believe he can scare us by evoking the prospect of wars. Anyway, if someone wants to start a war, he is most welcome. He will be well received. We are not afraid of war, it does not worry us. We are ready and we shall come out victorious with the Grace of God. It's a certainty. Therefore it seems that the idea of ​​resorting to war was discarded. What do they want to do instead? Two things, and the first leads to the second. The first is sanctions. Within the Resistance Axis, Iran is today the main force. Iran stood alongside the Iraqi people against ISIS, and in Iraq, ISIS was a Saudi-American project. Iran stood by Syria against all the takfiris movements who fought as part of a US-Saudi project. Iran stood by Lebanon during the 2006 war, before 2006 and after 2006. And Iran has stood by Palestine and Gaza and continues to stand by their side. And the position of Iran with regard to what is happening in Yemen and in the region is clear. (The Saudi-Israeli-American axis) therefore wants to target Iran. It is not possible for them to launch a war against Iran, so they imposed sanctions on Iran, in the hope that the Iranians are affected, the currency collapses, the social and economic situation becomes difficult, that disturbances are fomented inside Iran and that the Iranian people be pushed to overthrow the regime, so that the US can present themselves as the saviors and redeemers. And they think that if they pressure Iran, the whole (Resistance) Axis will weaken, (all) those who rely on Iran, count on it and are supported by it. Iran will get isolated, Hezbollah will be subjected to sanctions, as well as Syrian and Iraqi officials, something they have already done, etc., in order to besiege them financially, economically, etc. And this is supposed to weaken them and force them to back off and renounce (the Resistance). And the second thing is to push to internal unrest in Iran, Iraq, Syria, Lebanon and elsewhere. In Lebanon, I say it between brackets, and I will return to it in a moment in my last section on the internal situation, you must know that everything that is written in social networks and in the media, all the requests adressed to Hezbollah (to act) in the sectors of economy, development, finances and services, those who make them do not all have good intentions. There are people who have different (bad) intentions. There are people who try to make us bear the responsibility for this situation of which we are not responsible, or if we are responsible of it, it is only to a certain extent, in order to stir up trouble in our popular base and in our society. Therefore, the last hope of Trump, Israel and all those who stand with them is sanctions. And about sanctions, there is a great effort in the media, and the image (of the potential impact of sanctions) that is presented is not realistic. And in August 14, the day of commemoration of the victory, my duty is to clarify this point to you and to all who listen to me, wherever they are. This Iran to which Trump imposes economic sanctions, I say this on the basis of information and very precise data in my possession, I tell you that they build their dreams, their strategy and project on the fact that this will lead Iran to internal unrest and the overthrow of the regime. But these are illusions, chimeras that have no place in reality. I remind you that in 1979, when the Islamic Revolution led by Imam Khomeini, may God sanctify him, triumphed, the arrogant Western world said that the regime would collapse within 6 months, but it stood 6 months despite sanctions and the global blockade. Then they said it was going to collapse in a year, but it stood firm. Then they said two years, but it stood. Then they imposed the 8 years war (launched by Iraq). And the whole world was with Saddam Hussein, except Syria and a small number of countries. The whole world (was against Iran). Even those who are now our allies in Syria. Even the Soviet Union was with Saddam Hussein. Even China was with Saddam Hussein. The whole world was with Saddam Hussein. And Iran fought for 8 years, with its bare chest and its empty hands, but with faith and popular will. Iran is under sanctions since the triumph of the Islamic Revolution in 1979. True, Trump strengthens the sanctions, but sanctions date from 1979. And Iran has remained, and will soon celebrate the 40th anniversary of the triumph of the Islamic Revolution, despite all the conspiracies of the world and the (hostile) neighborhood (Saudi Arabia, Gulf). I say this (with certainty) o my brothers and sisters, o those who profess and believe in the posture of justice and truth of the Islamic Republic of Iran in the equations of the region, in the fate of the region and its future, the Islamic Republic of Iran in our region today is stronger than ever, and it is even the first power. And they can not reduce its power or presence or hurt it. The regime of Iran is powerful, strong, determined and rooted, and protected by its people. Those who nourish these hopes (to end the regime) are dreaming awake and do not know the Iranian people. They have failed to know this people for 40 years and will not succeed in 100 years. And they do not know His Eminence Imam (Khamenei), the Leader, and they do not know the officials of the Islamic Republic. They are still ignorant, foolish and stupid. And all their past actions have not led to the weakening of Iran; on the contrary, Iran has continued to strengthen. All the stupid actions of the US administration and their instruments in the region against Iran or the region led Iran to become increasingly powerful both inside and in the region. To prove it in detail would be long, but the evidence is clear for all. And also in our case, regarding all our (Resistance) Axis in the region, I do not claim that the sanctions have no impact, of course they have an impact, we should not deny it. But sanctions will have no impact on our determination, our will and steadfastness, nor diminish our strength. Impose all the sanctions you want. 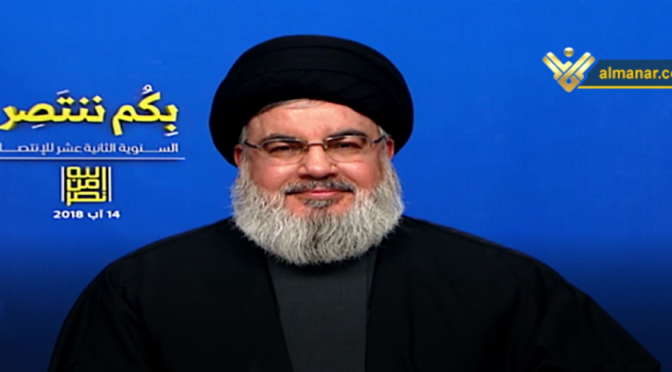 Today, we possess in terms of strength –and they begin to wonder what will be the effect of sanctions on the financial situation of Hezbollah–, we possess in terms of strength, infrastructure, cadres, men and capacity what will allow us to overcome these difficulties, with the Grace of God. In light of all what I have just presented, I conclude before saying a few words about the internal situation in Lebanon, to draw the lesson from all this. The lesson of all this, all the past, present, and what is to come, I want to say on this August 14, 2018, 12 years after the 2006 war: O Lebanese, O honorable people, O the noblest people, most worthy and most glorious of peoples, O peoples and masses of the Resistance, we were (already) stronger (than our enemies) and we became (even) stronger. Let no one try to make us believe that we are weak. Let no one imagine that if a crisis happens, or if we have a problem here or there, and some nonsense and insults appear (in the media and social networks), it may alter our soul, our determination, our will and our strategy.